Caitlin Macklin is back on the blog with a cool invitation for your kids. Caitlin plays many roles in the Austin community, including those of founder and teacher at Radicle Roots Community Schoolhouse, trombone player in marching bands, parade enthusiast, and, most recently, new mom! Here at Radicle Roots Community Schoolhouse, we’re gearing up for Parade!Club 2015, and you’re invited! This will be our third year to put out the call for families with children of all ages to be part of the Honk!TX excitement. Come march in the parade with us! Honk!TX is one of our favorite Austin festivals. Twenty-some community brass bands descend on the neighborhoods around town to play for free! Come out and participate in the transformation of our public places into joyous celebrations of community and music. To join the Ruckus Parade!Club, follow our Vimeo channel and like us on facebook so you will not miss any of our video installments or Club announcements. Your family prepares for the big day at home by making cool costumes and parade crafts (our colors are RAINBOW, so be as colorful as you can! ), and learning the parade songs we will sing and dance to. Another way to participate is the Parade!Club Open Shop. 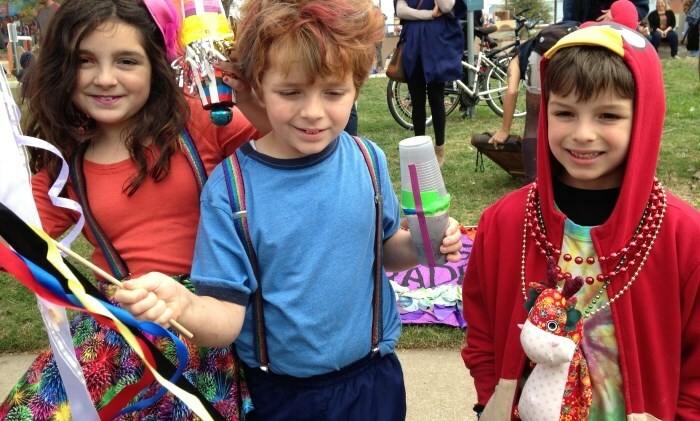 The illustrious Austin Tinkering School will be hosting this crafternoon on Sunday, March 8, from 1:00 to 4:00 p.m. Bring raw materials to make your own costume, musical instrument, flag, or ribbon dancer. Participate in the creation of giant street puppets. Play games and get to know other families. RSVP here. It will be a blast! Then join the Club for PARADE DAY on Sunday, March 29, 2015, at Pan Am Park! Line up at 11:00 a.m. sharp; parade rolls at 12 noon. 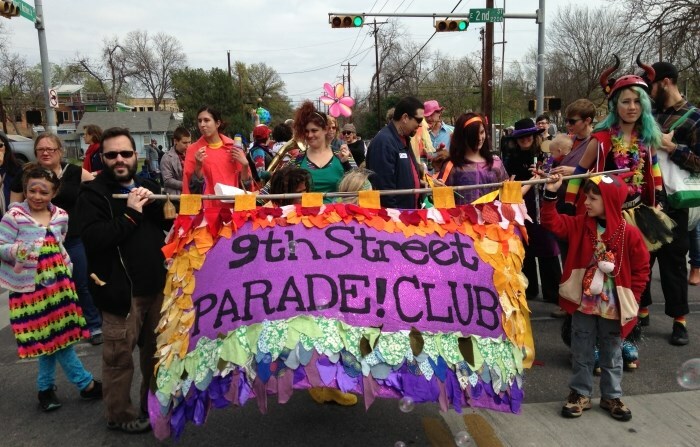 Show up in your hand-crafted finery ready for a jaunt through East Austin led by the combined forces of the Yes Ma’am Brass Band and the Hey Lolly Brass Band. So fun! WHY: Reclaim public space for joy and music! This call is open to one and all, so pass the word along to anyone you want to dance in the streets with. YOUR KIDS are the main source of creativity for this spectacle, so go all out! Get together with friends for a Vimeo watching party, host a costume crafternoon for your school, or come up with dance routines to the songs with some neighborhood kids. Parents need to accompany their children during this family event; strollers and wagons are welcome to assist little legs. The parade is a mile and a half long or so—that’s about two hours. Last June, we said goodbye to our original East Austin home on 9th Street and loaded up bikes, trikes, and trailers to relocate the Schoolhouse. 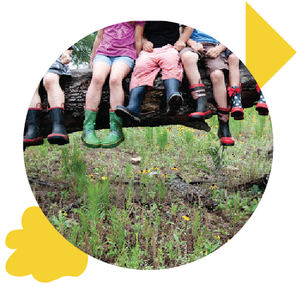 In our new spot at 3310 Red River, we’ve become Radicle Roots Community Schoolhouse! We are sharing the space with the incredible and creative after-school and summer camp program Spilled Milk Social Club. That means we are better able meet the needs of working families by offering on-site after care. We already strive to keep tuition as low and accessible as possible. We are excited to have plenty of room to grow in this beautiful building, and we look forward to this new chapter in the life of our learning community. 1: the smallest part of the seed that becomes the root. One of the things this means to us is that we guide our students to seek within to discover their passions, talents, gifts, and interests during Self-directed Learning. If you’d like to find out more, we’d love to show you around during a parent tour, happening every Wednesday until March and alternate Wednesdays after.